The Lancia Stratos HF was a Bertone designed rally machine that was designed as a replacement for the aging Fulvia Coupe. It had radical for the time (but gorgeous upon reflection) styling by Marcello Gandini and was powered by Ferrari built Dino V6, but with only 492 built for homologation purpose, it won’t be something the average Joe can afford, or ever drive on a regular basis. 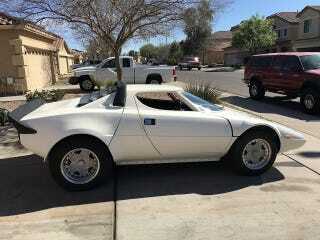 Even if you were a rich Joe you wouldn’t drive the Stratos on the street for fear of getting T-boned by a snap chatting teenager; actually you’d be better off leaving the real one in the garage and tooling around this 1976 Lancia Stratos Replica offered for $24,700 in Phoenix, AZ via craigslist. Tip from JAS. Instead of the usual Fiero based monstrosity that masquerades as a Stratos replica, this car looks to be built from a fiberglass composite body on top of a steel space frame — a very similar construction technique to the actual Stratos. Behind the driver’s seat is a Honda D16A1 twin-cam that came from an ‘80s Acura Integra and good for around 113 horsepower and 99 ft-lbs of torque. It is currently stock looking, but the seller includes a small Garrett turbo that could be used to up the fun level. The unfortunate truth about this Stratos replicar is that it is far from finished — you can read more about the build and see a pile of photos here on the sellers website. Originally published as Hawk HF2000: 1976 Lancia Stratos Replica on DailyTurismo.